Since I decided to lay low in the Blogosphere while I look for work, I've still had the urge to put up some posts. However, while I'm not writing the weekly wristwatch posts for the time being, I figure I can still put up some kind of content without having to stick to a weekly deadline. I had always planned to write a little more about movies. You may recall this post from December last year. It was about the imminent closure of one of Melbourne's last independent suburban cinemas, The Astor Theatre on Chapel Street, Windsor. I went along to see a Sunday afternoon screening of Billy Wilder's Sunset Boulevard. ...but I always suspected that I would have more movies to write about, since I really couldn't just stop at five films, now could I? The story takes place in Barranca, a South American port town in the Andes, and centres on a group of pilots who do the mail run through a treacherous pass in the mountains. This small airline's owner has signed a six-month contract to deliver the mail on time, regardless of the often hazardous weather conditions. If this airline can stick to its schedule for the contracted period, then it will win the major contract, which will mean more money for the airline and better, safer planes for the pilots. A ship arrives in port for a four-hour stopover. A young American cabaret performer named Bonnie Lee (Jean Arthur) disembarks, with a notion to take in the sights and maybe pick up a souvenir before getting back on-board the ship and heading back to The States. She meets a couple of the devil-may-care pilots, played by character actors Noah Beery Jr (who would later appear in the 1970s TV series The Rockford Files as Uncle Rocky) and Allyn Joslyn. These two guys are on the make, but when she meets them, she's just happy to hear a couple of American accents and takes them up on the offer of a drink. I have to say I really like Jean Arthur in this film. She started out in silent films, but her career didn't begin to take off until she appeared opposite Edward G. Robinson in John Ford's The Whole Town's Talking in 1935. However, it was in the following year that she appeared in Frank Capra's classic, Mr. Deeds Goes To Town, starring opposite Gary Cooper, and she was well on the way to becoming a major comedic actress. She again worked for Capra in 1939's classic, Mr. Smith Goes To Washington, and it was this same year that she starred in Only Angels Have Wings. I like the way Miss Arthur plays the role of Bonnie. She arrives in this new world of fatalistic flyboys and we slowly see her come to terms with their way of thinking. Into this mix, of course, there's Cary Grant as Geoff Carter, the pilot who manages the airline on behalf of its non business-minded owner, Dutchy, played by another great Hollywood character actor, Sig Rumann. Grant enjoyed continued success in films throughout the '40s and '50s. He is my favourite of the old Hollywood stars, without a doubt. Whatever I may have learned about how to be a gentleman and how to dress well, I learned from Mr. Cary Grant. 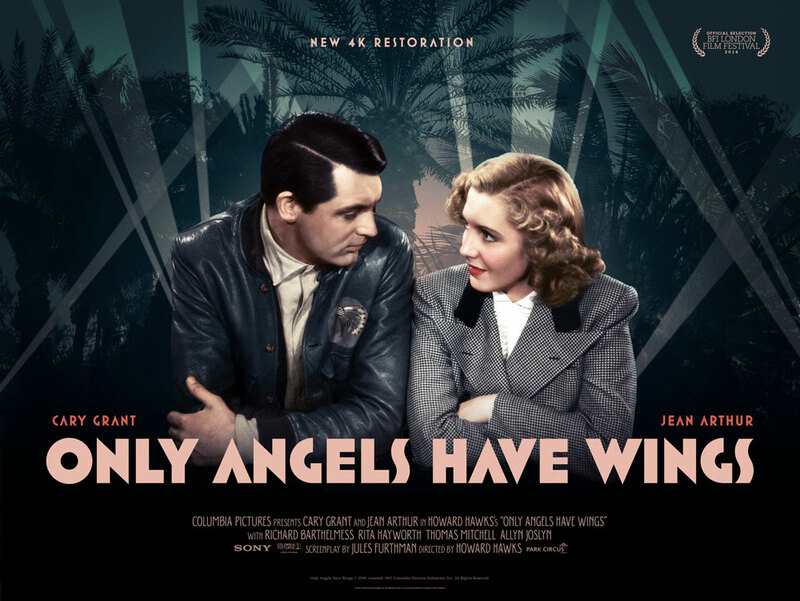 He's great in Only Angels Have Wings. Grant's on-screen persona was already established through his earlier work in screwball and romantic comedies, and you can see hints of it in this more melodramatic film. Carter runs a tight ship. He knows it's dangerous work, but he also knows that sending these pilots out on the tough assignments will ensure that the airline continues to operate. However, the really tough jobs he keeps for himself. Firm, but fair is our Geoff Carter. I won't say much more about the story, except to say that it takes numerous turns into what would be considered high melodrama and cliche these days. When the airline is short of pilots, along comes a new flyer who was previously responsible for the death of the younger brother of one of the pilots. What are the chances, eh? Still, this was film-making in 1939. I've already mentioned some of the supporting cast, but special mention goes to Thomas Mitchell, who plays Kid Dabb, Geoff's best friend. Mitchell also memorably appeared as James Stewart's Uncle Billy in Frank Capra's Its A Wonderful Life in 1946. Hollywood had a great stash of character actors back in its Golden Age. She would go onto greater fame, most notably in the title role in the 1946 film noir classic, Gilda (Dir: Charles Vidor), and she turns in a good performance here as the wife of the new pilot. Rumour has it that Hawks treated her poorly during filming. Hayworth has gone on record to say that she would have quit the production had it not been for Cary Grant's kindness and respect. This is an atmospheric film. Cigarette smoke is thick in the air, the floor must be littered with spent matches, based on how often somebody lights up, it's always either thick with fog outside or pouring with rain, and yet you get the impression that it's a humid locale. Hawks went to great lengths with his aerial footage, which has often been cited as groundbreaking for its time. This scene above looks great and it perfectly captures the vastness of the locations used. Much of the take-off and landing shots were done with models and it does look clunky when you can see the wires, but so what? It was 1939, remember? Hawks trained as an Army Air Service pilot during the First World War, but the conflict ended before he saw any action. Aviation would be a recurring subject in some of Hawks' films of the 1930s. Joseph Walker's cinematography makes wonderful use of the lighting. While the scenes were shot on studio sets, they are lit beautifully and the mise en scene is arranged nicely in just about every scene. Mise en scène encompasses the most recognizable attributes of a film – the setting and the actors; it includes costumes and make-up, props, and all the other natural and artificial details that characterize the spaces filmed. The term is borrowed from a French theatrical expression, meaning roughly “put into the scene”. In other words, mise-en-scène describes the stuff in the frame and the way it is shown and arranged. I had a copy of this film on video-cassette back in the late 1980s, recorded off tv. I bought it on DVD about five years ago and had planned to do a write-up on it. Film itself, or rather, the celluloid used in its production, is quite brittle and it begins to deteriorate quickly as time rolls on. I've read of some classic films that turned to crumbling flakes in their canisters after decades of sitting in storage. There is a vast trove of classic films out there that need to be saved so that future filmgoers can see what all the fuss was about. For every Spielberg, there is a Hitchcock that influenced him. For every Star Wars, there's The Searchers and The Getaway where certain scenes were borrowed. Martin Scorsese has cited Michael Powell & Emeric Pressburger's 1948 classic, The Red Shoes, as an influence on his work. That film was about a ballet dancer. Go figure. Although, when you see this film, you notice some camera work in it that Scorsese has used in his own films over the years. I got a lot of time for Marty Scorsese. The man loves movies. So, I was very happy to see Only Angels Have Wings in this restored version. This screening had a good turn-out of people. And I was very happy to see it on a big screen, in a cinema that's been given a chance to continue. Yes, there are the multiplexes in the suburban shopping centres where one can go see the latest Avengers film or the newest Judd Apatow comedy. We need these multiplexes, but we also need these smaller, single-screen movie-houses that show films as diverse as Only Angels Have Wings, Singin' In The Rain, Taxi Driver, The Searchers, Leviathan, Get Carter, Dazed And Confused and Blade Runner. That's The Astor Theatre's first-week line-up of movies. Plus the two Avengers movies, with prizes handed out to audience members who up in the best costumes. It'd be worth going along just to see that! Oh, and another thing- I missed out on the final screening of Casablanca at The Astor last year because it coincided with my daughter's dance school concert performance. Well, they'll be showing it in August. I'll be there. Might even wear my hat and trench. I may have to get a copy of this poster somehow. Special thanks to Wikipedia and IMDB for cast and crew info. All photos screen-capped and cropped from my Columbia Classics DVD copy, 2005. Great post. I love this movie. That shot of the airplane you 'capped is great. I can't even remember how I came to this movie - it might have just been something I wrote down for myself after reading or hearing about it, or checked out on the strength of Howard Hawks, Cary Grant, or Rita Hayworth, I'm not sure. How cool you saw a 4K print. I couldn't agree more on the importance of preserving the classics, and a chapeau to Scorsese for introducing to the topic to my head. I assume you've seen his Personal Journey documentaries? Great stuff if not, but I doubt you missed those. I don't know if I've checked out every single film he explores / namechecks in those, but I'm close. Those definitely altered the trajectory of my film absorption habits. Course-corrected, in many ways. Anyway - Only Angels Have Wings. A pleasure to watch, in any age, from any angle.